An examination of “administrative earmarks” around the time of congressional votes on key pieces of President Obama’s agenda suggests the White House used its power to fund local projects as a means to “buy” votes for major legislative efforts. But an analysis of grants from agencies during the early years of the Obama administration shows that the districts of moderate Democrats, whose support was so crucial for Obama during the 111th Congress, received large sums right around the passage of three key pieces of legislation: Obamacare, Dodd-Frank financial regulations, and the cap-and-trade bill. During the run-up to votes in the House of Representatives for each of those pieces of legislation, the rate of administrative earmarking spiked. This chart shows the number of grants requested by 12 federal agencies, as documented at Grants.gov. The number of grants given by those agencies spiked precisely when the House was considering each of the three pieces of legislation. Even more troubling: during the same time periods, significant grant money went to the districts of numerous Democratic representatives who looked to face tough battles for re-election. The legislation Obama was attempting to get through Congress was generally unpopular, and vulnerable members needed other ways to appeal to constituents. Federal grants made for a perfect opportunity. Then-Rep. Chris Carney (D-PA), for instance, kept his support for Dodd-Frank quiet. His website never posted a press release announcing his “yes” vote on the bill. It did, however, tout two federal grants totaling $3.6 million for businesses in his district two days before the Dodd-Frank vote. Then-Rep. Zach Space (D-OH) hailed from a district reliant on the coal industry, which would have been hit particularly hard by cap and trade. He voted for the measure, but neglected to publicize the vote on his website. He did, however, announce eight federal grants totaling roughly $1.8 million all made during the month before the House passed cap and trade. 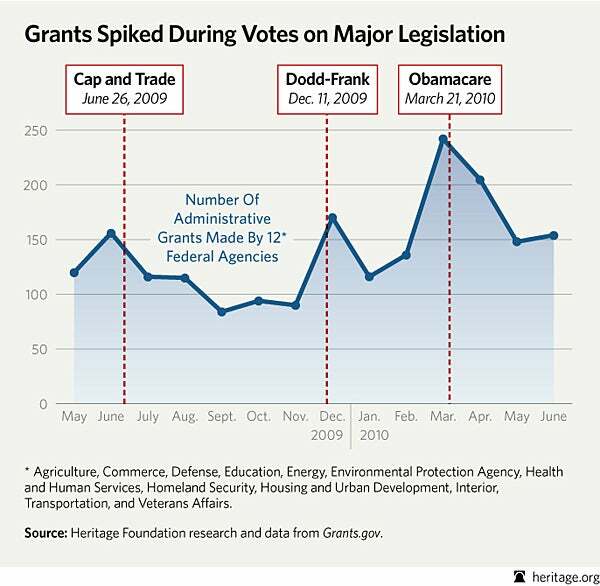 At least 32 vulnerable House Democrats received significant federal grant money in the periods leading up to or directly after their votes on at least one of these three pieces of legislation (see charts below), raising concerns that those grants may have been used either to encourage or reward votes in favor of the administration’s position. President Franklin Roosevelt was an early pioneer of the political use of administrative earmarking. He “deliver[ed] large defense projects to key states whose electoral votes he wanted to secure,” according to historian Burt Folsom. But while administrative earmarking is a practice used by nearly every administration, CRS found in a report published in April 2010 — immediately after the time period at issue — that “[b]oth the number and value of earmarks requested solely by the President increased since FY2008.” The number of earmarks had increased by 54 percent, CRS found, while the value of those requests had increased by a whopping 126 percent. While speculating on the motives of individuals responsible for these grants is difficult, this administration has a history of using its powers for political purposes. In the case of “vote-buying” in particular, the administration offered to expand Medicaid funding to residents of Louisiana and Nebraska to the tune of roughly $145 million to secure the votes of Sens. Mary Landrieu (D-LA) and Ben Nelson (D-NE) for the Obamacare bill.